New Point of Sale Materials - Meet Your Farmer! We have developed some colorful new posters introducing Monadnock Menu producers. These are available to hang up in your cafeteria, restaurant, or anywhere food is served. We are dropping off posters with all orders, but are happy to mail them to you upon request. 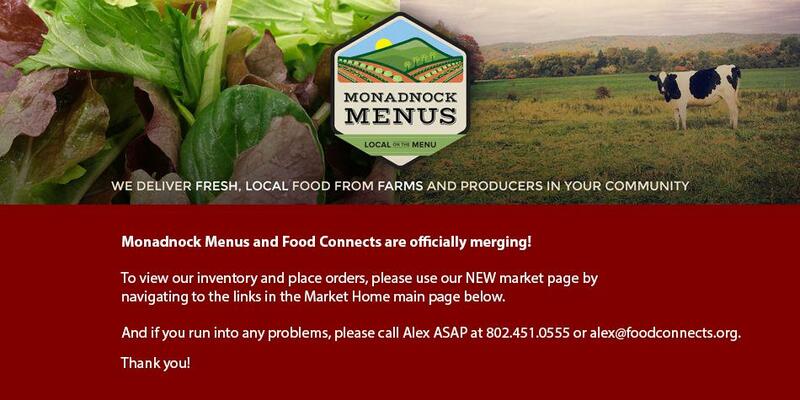 Monadnock Menus will be open year round as there are still many local products available. Winter greenhouse production is picking up, root crops are still being harvested, and bread, yogurt, and meat are around all year. Sweet Potato - is a root vegetable that is only distantly related to the potato. While the tuberous roots are most commonly eaten, you can also cook up the leafy greens. An excellent source of Vitamin A, they are available from two local farms. Not just for Thanksgiving, try this simple but delicious recipe any day. Steam the sweet potato until soft. About 15 minutes. Saute the onion in the coconut oil until golden brown. Mash the sweet potato and onion together in a big bowl.